Having seen all that we wanted to in Yogyakarta, we were now ready to move on. 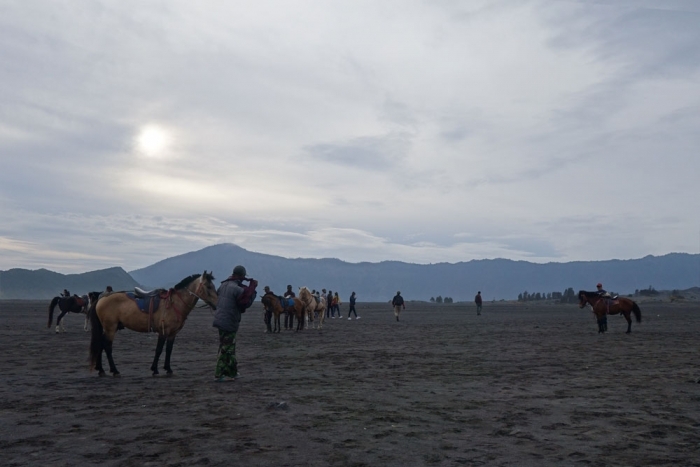 We had only one more sight we wanted to visit in Java before we took the ferry across to Bali and that was Mount Bromo. 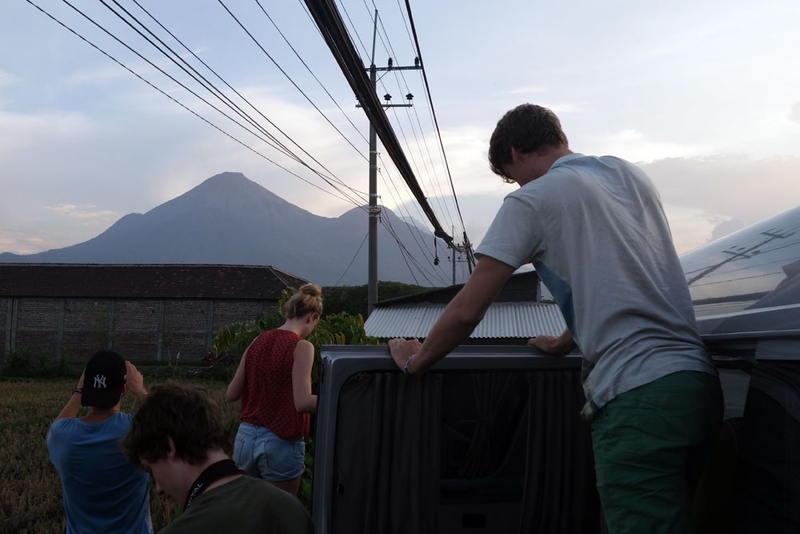 Although public transport and other options exist, having attempted improvised travel in the past and knowing that there are a lot of scams for people attempting to do this route in Indonesia, we were much more keen to remove as much uncertainty from the trip as we could. Our ideal plan was to arrange a trip which picked us up from our accommodation in Yogyakarta, visited Mount Bromo and ended in Bali, and happily discovered that such a trip was available to book through our accommodation with Kresna, the company who had taken us on a tour of the temples the day before (IDR570,000/~GBP28.50 each). 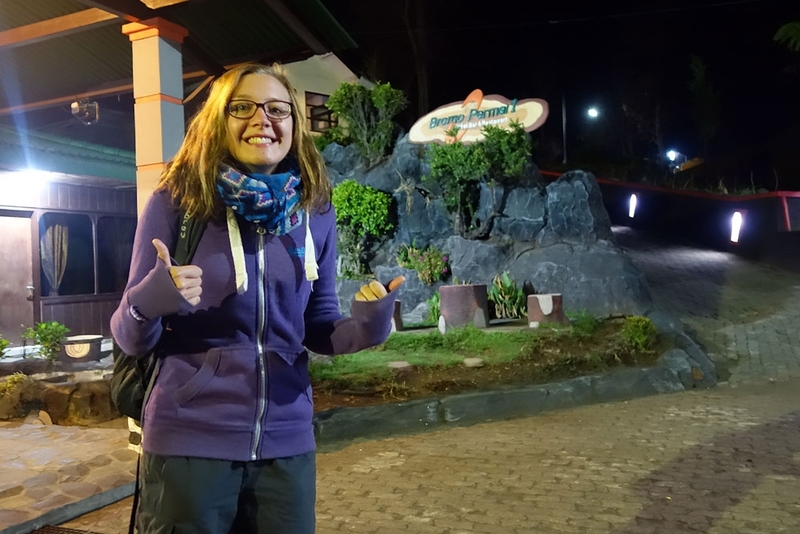 The first day is arduous; from the pickup at 8am in the morning to arriving at our accommodation in Cemoro Lawang at 10pm, you are pretty much spending the entire day on the road. The mini-bus itself was small but clean and blissfully air conditioned so other than numb legs, there isn't too much to worry about there. If you were to drive yourself however, I suspect, it would take a good deal longer; Our driver was either a brilliant driver or an insane one. I think we spent about 30% of the journey on the other side of the busy roads, in some cases pushing drivers coming the other way onto the side of the road to let us through. We stopped off for food at a tourist trap of a restaurant (not included in the ticket of course) but I think such things are something best expected on such tours. Toilet stops were another interesting thing - think best described as a ladle floating in a barrel of water beside a hole. One thing to note which is useful, there were some points where people wanted to stop and take a photo and it turned out that you could simply ask the driver to pull over for you (if there is opportunity to do so), you could also request to pull in at the next rest stop if you needed to use a bathroom. We were coming near the end of the journey, with Bromo in our sights when the bus stopped at a shelter in Probolinggo. There was a bit of confusion as we were hustled out of the bus without explanation and our tickets demanded but thankfully after a bit of uncertainty it transpired that our tickets were being swapped to a different set or separate tickets for the various activities (accommodation, different jeep tours etc). Finally we loaded back into a new van and headed up to our basic hotel in Cemoro Lawang. When we were dropped off in our room we had another shady moment where the bus driver asked us to pay him for the national park entry fee as opposed to paying the front desk of the hotel - again we had known in advance that this fee would be levied and had a sneaking suspicion that a lesser amount of money had exchanged hands to get us in, but we rolled the dice and paid for the passes he gave us. By the time he left us to settle into our basic room it was just after 10pm, aware that we'd be picked up in 6 hours for our trip to see the sunrise - plenty of time for a spot of planning. When we had arranged the trip at our homestay the previous day, we were able to choose Denpasar as the end destination but our host who arranged the trip was unable to tell us where in Denpasar we would be dropped off - something we would need to clarify on the journey. Preliminary googling showed that there would be two main bus depots in the city; Ubung - our best guess - which was the central city stop and Mengwi, a terminal north of the city. Unfortunately this is Indonesia so searching for 'hotel' on Google maps wasn't a very useful strategy, in fact, Google was having difficulty deciding where exactly the two terminals were located. Nonetheless Lisa had come up with a rough shortlist of accommodation options in the city, mainly around Ubung terminal which we planned to shorten once we finalised the drop off location. We'd been told drop-off would be around 8pm so wouldn't have much time to walk around and find anything when we arrived. Thankfully, during the stop at Probolinggo we'd been finally able to ask about which bus depot we would be dropped off at and found out to our dismay that it would be Mengwi, which was the significantly more isolated of the two, with pretty much no accommodation close-by that we had found. So we found ourselves, with 5 and a half ours of sleep counting down, researching what was around Mengwi in an effort to secure accommodation. There was almost no results nearby and, having experienced it in the past, we knew that the taxi drivers we would find waiting for us at the bus terminal would be very much happy to exploit our isolated position. There were some articles on the internet that indicated there was accommodation around the Mengwi terminal, despite us not being able to find any online, so we decided on a final plan: We would check out the accommodation options close to the terminal and see if we could find somewhere there and, if not, attempt to locate a semi-friendly taxi driver to take us to Pop Hotel, a more distant but decent looking accommodation option with a 24-hour reception. Plan in place, we dropped into bed to try and get as much sleep as we could for the next day's adventure. The alarm(s) went off a little too loudly for 4am wakeup but somehow we both managed to roll out of bed into warm clothes (temperatures are surprisingly chilly around Bromo, dropping to around 4oC in the night). A few minutes after 4am a 4-wheel-drive (4WD) rolled up and we jumped in, surprised to find 5 people already there (2 in the front seats and 3 in the back with us). 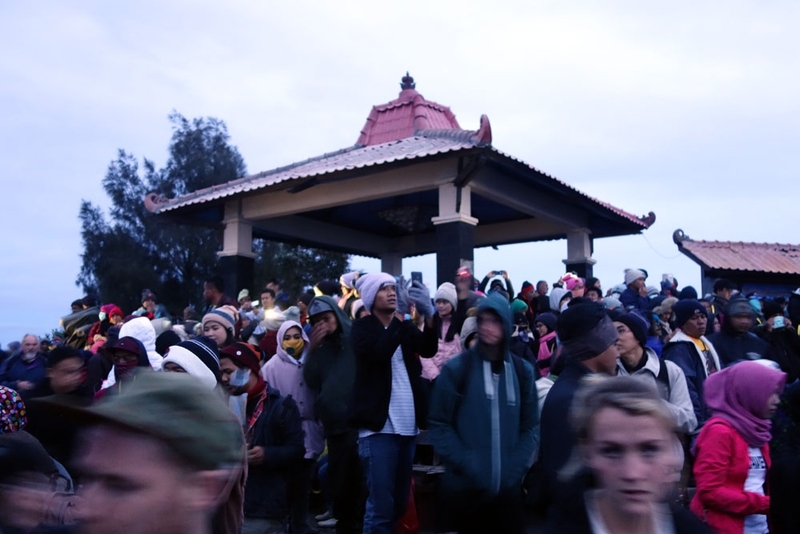 Crammed in the 4WD, we drove to the lookout on Mount Pananjakan. Thankfully, unlike the lookout over Borobudur temple, we didn't have to pay an additional entry fee for this one, but it was considerably busier and filled with entrepreneurial locals offering to rent warm clothes and selling coffee to shivering tourists. The lookout at Mount Pananjakan offers a great view, although good photo spots in the viewpoint can be quite competitive. We finally found a bit of railing which we slowly pushed our way on to wait for sunrise. 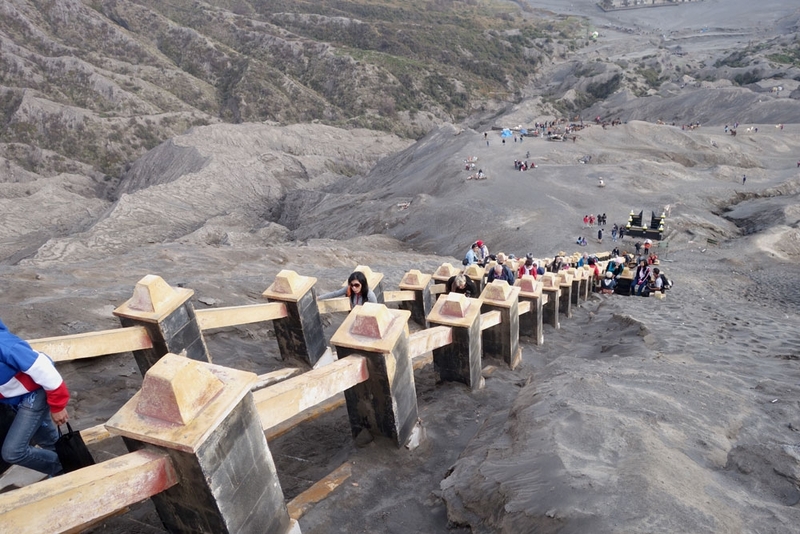 Mount Bromo is one of the peaks in the Tengger massif which is the collection of mountains you'll hopefully be looking at with the other hundred or so people. It's worth noting that Mount Bromo isn't the tallest peak in the massif, but rather the smaller peak with a large crater visible inside it (it will be more likely marked by the smoke/steam bellowing from it). It may have been the conditions on the day that we went, but although the view of Mount Bromo at dawn is excellent, the sunrise itself was a bit anticlimactic. 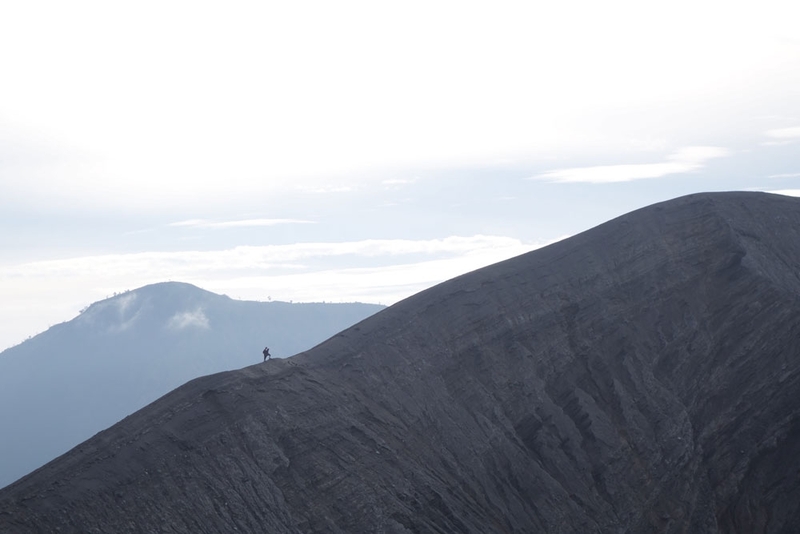 Having seen Mount Bromo from above, it was now time for our group to reassemble at the 4WD and head back down, across the 'sand sea' to foot of the peak. 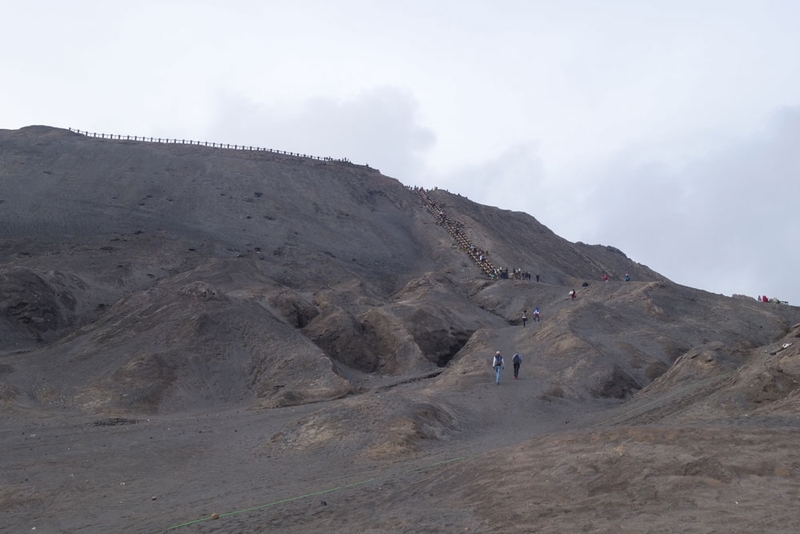 The walk is in two stages; walking across the sand and up a wide, meandering path to the beginning of the peaks steep slope, then walking up the steps to ascend to the edge of the crater. You will have the option of hiring a pony to take you up the first section to the foot of the steps. The ponies won't be hard to find; we could barely get the door of the 4WD drive open with the number of people pushing them at us. It is a deceptively long trek on foot through the sand - in the end it took us almost 20 minutes to get from the 4WD to the crater edge. One option that Lisa didn't want to pursue is that you can walk around the edge of the crater which looks like it yields some great views. We only had an hour to see the peak, including that 20 minute walk so we wouldn't have had time even if we wanted to. One of our group did break off and do it, telling us to drive on without him and that he would meet us back at the accommodation (which was about 45 minutes away) - it caused a bit of confusion explaining this to the driver who almost refused to leave without him but in the end it worked out! Bromo done, it was back to the accommodation for breakfast before we began the journey to Bali. 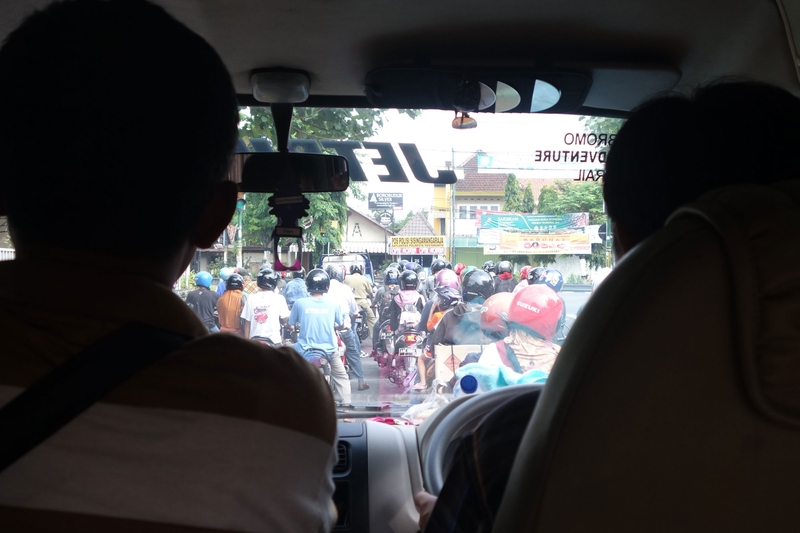 At 9am our bus pulled up to take us back down to Probolinggo again where the group was set to split to our respective destinations. 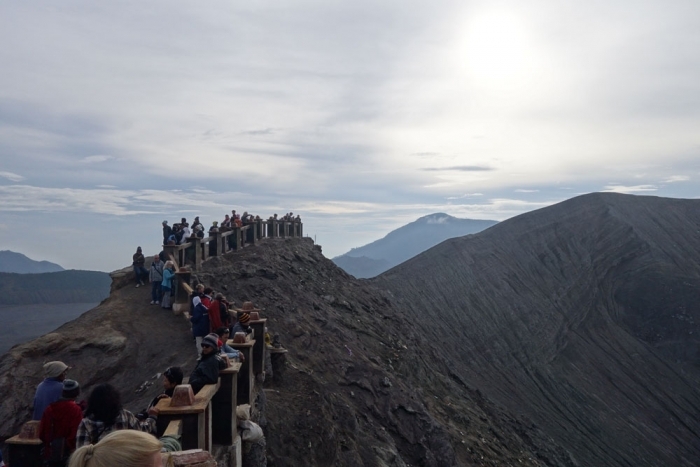 The majority of them had arranged an onward trip to see the Ijen volcano complex with it's 'Blue Fire Crater'. 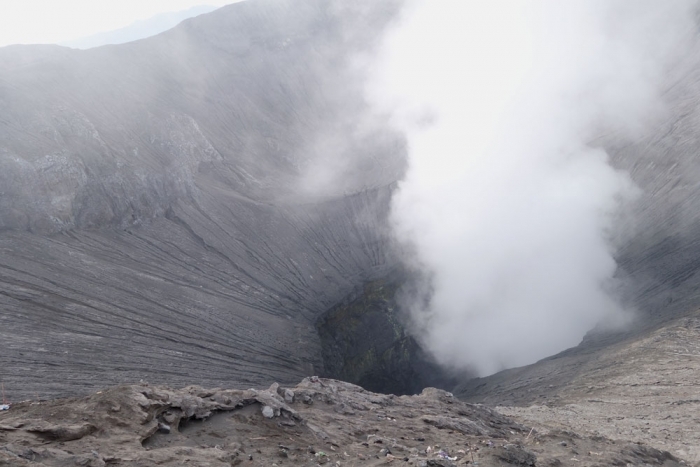 We actually had somehow not heard of Ijen before we found it out from the group but it sounded quite interesting - I don't think we would have spent the extra day going to it, but from their 3 day itinerary it did split up the journey to Bali a lot better. Our drama began before we even started down the mountain; after a few funny noises, the bus - still thankfully in Cemoro Lawang - pulled in and after a few minutes of watching the driver scratching his head, we were transferred to another bus to take us down the mountain. Again at Probolinggo we got out and waited until finally a much larger bus pulled up and the few of us heading to Bali were ushered onboard. The bus seemed to be not exclusively a tour bus but rather a coach carrying a mixed group of people, some local, some tourists. On its way to the ferry it would occasionally stop to pick up more people acting somewhere between a private coach and a public bus. Finding the only pair of free seats available (beside the toilet and unable to recline, unlike the ones in front of us) we settled in for our next 12 hour journey. After a few hours of travel we arrived at a rest stop clearly a lot less targeted towards tourists. The main meal option was a dome of rice accompanied by our choice of sauce from a selection of open vats. Being the main option we both went for the least noxious looking but having seen how our gut handled it, I think it would have been better to just buy some biscuits or not eat... Food consumed, we re-boarded the bus and made for the ferry terminal at Ketapang. The ferry schedule is apparently quite loose so there is always the risk that the bus will just miss the previous ferry and have to wait for the next one, but thankfully for us, our arrival timed perfectly with the arrival of the next ferry which meant we almost immediately drove onto the boat. Getting off the bus we were able to find a seat on the boat's deck and wave goodbye to Java as we departed the port. 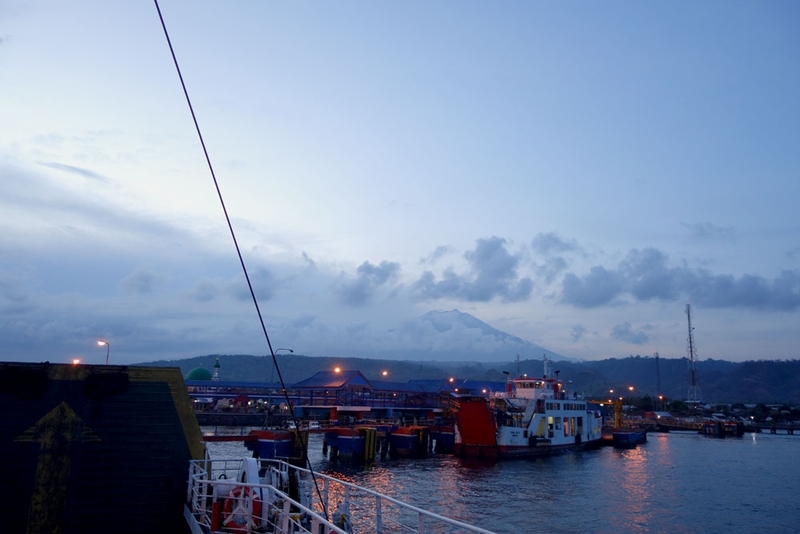 It is a relatively short stretch of water and the ferry journey, although stopping and starting several times, made it across in less than an hour. Back on the bus and with the first hints of night appearing, we were starting to get a bit nervous as the 8pm estimated arrival time approached and the blue dot of our bus location only very slowly moved towards Denpasar on our Google Map. Night fell, storm clouds rolled in and despite Lisa's optimism, 8pm came and went and we were still on the road. 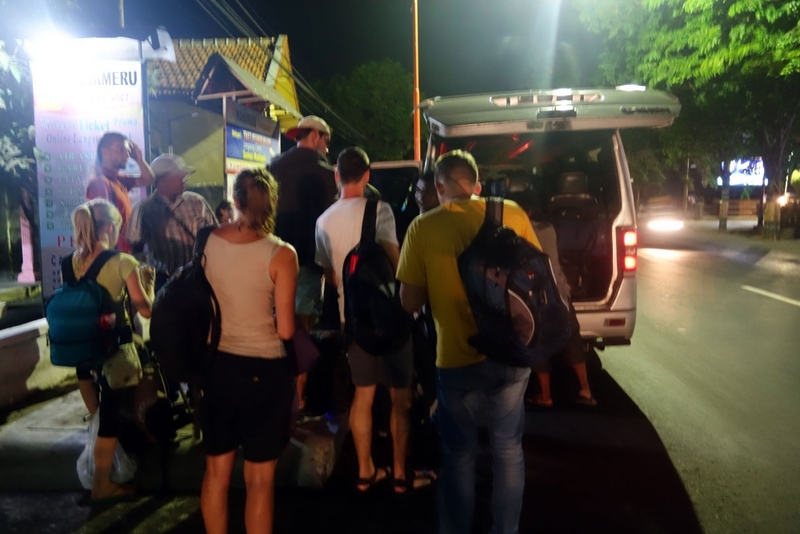 At around 10:30pm, when we were almost at the Mengwi terminal the bus pulled in to a complex just out of town and a man got on saying that everyone who wanted a taxi into Denpasar, Kuta or several other main destinations needed to get off with him. We had heard of this before and, as one of our tourist bus companions noted, once you get off the bus, you are stuck with them and they can charge you whatever they want. After insisting we stayed on the bus, he finally left us and the small amount of remaining passengers alone - in truth we were surprised at how many people had got off - and the bus started again for the final stretch. At 11pm Mengwi bus terminal is a fairly desolate place. We got off the bus in the rain and grabbed our bags before joining the small huddle of remaining tourists; a Spanish couple and a German mother and daughter. 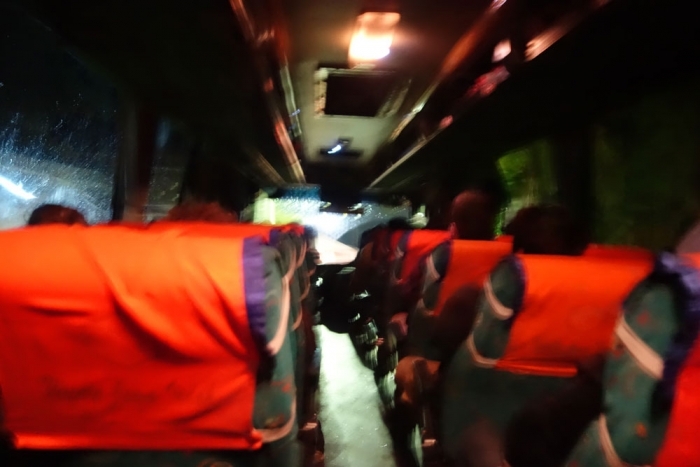 Hopeful that the others had arranged a place to stay or at least were aware of a nearby one, we started chatting with them as a group of shuttle bus drivers began tentatively yet persistently probing us with questions of 'Where are you going? ', 'Do you need a lift?'. Our hopes that one of the others in our group were abandoned when the Spanish guy pulled out a phone and asked a driver if the depot had WiFi (there isn't in case you are wondering). I offered him my phone thinking he was looking for directions but when he pulled up an accommodation search website we realised they had less of an idea than we had - the German pair looking hopefully over his shoulder also didn't look encouraging. Looking out into the darkness surrounding the station, I think Lisa and I had dismissed the idea of a walk around the area without having to discuss it so we were thankful that we had a plan B - head for our fall back; Pop Hotel. Knowing that the others didn't have another option, as soon as we suggested a clean, well organised looking hotel, the other 4 were on-board for us all going to Pop as a group of 6 which meant the split fare would be cheaper. Sadly however it meant that we weren't able to take advantage of the single metered Blue Bird cab that was sitting in the carpark at the front of the depot. The mini-van drivers who had come to meet us on the bus were happy to offer their services but were trying to offer prices per head as opposed to a price for the group. Leaving them and going for a walk around to see if there were other options, we found a group of bemo drivers who I was able to bounce the two groups' prices off one another until we got a less extortionate offer of IDR90,000 for the 6 of us, down from the original IDR300,000 they'd started at. Bemos normally operate by waiting until the bus is filled up before they depart but either the time of night or size of our group meant that we left straight away and headed off to Pop Hotel. Less than 30 minutes later, at around midnight we arrived at the hotel (delayed by the slightly confusing fact that there are two hotels with different names on the same site) and checked in to the last 3 rooms available. It was with great relief that we opened the door to our lovely clean room dropped our bags and fell on the bed. We'd made it, but sleeping had to wait a tiny bit longer - we had planning to do!